I started singing at the age of 17 and worked in dance bands for 18 months. My first bands were The Ross Mitchell, and Ray McVey Bands. Then I got my first tour doing background vocals for Suzi Quartro. We toured Poland and Romania and it was on this tour that I met Gill Saward who introduced me to the Shakatak guys. Shortly after the Suzi tour I toured with Sheena Easton, in the UK, America, Canada and Japan. After touring with Sheena I started working with Shakatak. At this time I also had two other projects going on. One was a band called Enigma and we had a top twenty record called “Ain’t No Stopping” and did Top of The Pops, and the other was called Minnie and the Metros, (I was Minnie of course, being only 4’ 10 3/4”). The record was called Charlie’s angel and was released through EMI. Of all three projects Shakatak started to take off big time so I devoted my time to the band. We became famous in England, Japan and Europe. I made three albums with Shakatak: Driving Hard, Nightbirds and Invitations and the later two went Gold. I left after the third album to work freelance but did work with them occasionally on other albums and tours. Straight after Shakatak I toured with Imagination and then Gary Numan. I also recorded one album with Gary, “Machine and Soul”. In between the tours which I loved doing I released a solo record. The song was called “I Believe in Dreams” it was first released in 1985 on Fanfare Records which was run by Simon Cowell. I re-recorded the track with Almighty Records in 1997. I was also featured on some dance tracks with a band called Midnight Sunrise. The tracks were “On The House” and “In At The Deep End”. These were released in 1986 on Nightmare Records. In 1987 I recorded a duet with Paul Carrack ( lead singer with Mike and the Mechanics), called" When You Walk in the Room" which was released on Chrysalis. 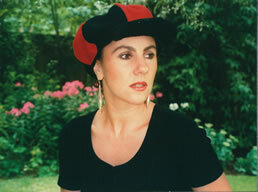 In the 90’s I was featured on and co-wrote a track called “Kingdom of Love” by Massivo, released on Debut. 1986 I started writing my own songs and had my first cover in 1987 with American artist Micky Howard. The song was called “Baby Be Mine” and went to number 5 in the American Soul charts. I co-wrote this song with Ashley Ingram, songwriter and bass player from Imagination. I signed a publishing deal with Warner Chappell Music in 1993 and have had songs covered with artists worldwide. Check out the CV page under songs covered. In 1993 I had my son Zach and stopped touring to do session work. I have sung on many chart records including Elton John, Celine Dion and Cher, and have been heard on many radio and tv jingles and adverts. Check out the CV page. I have just finished recording a solo album of songs with a spiritual, inspirational, and devotional nature in the lyric. The songs chosen were written over a twelve year period, and the musical flavour of the tracks varies from soul, funk, gospel, blues and jazz. I feel privileged to have worked on this project with some of the finest musicians in the UK, and the album is richer in spirit for their contribution. I have sent out samples of tracks already recorded and have received some wonderful endorsements, see the album page for information and to order copies.